This page (together with any documents referred to in it) tells you the terms and conditions on which we supply any of the products (Products) listed on our website realflowers.co.uk (our site) to you. Please read these terms and conditions carefully before ordering any Products from our site. You should understand that by ordering any of our Products, you agree to be bound by these terms and conditions. You should print a copy of these terms and conditions for future reference. realflowers.co.uk is a site operated by Wilsbury Ltd trading as The Real Flower Company (we). We are registered in England and Wales under company number 4618152 and with our registered office at Wey Court West, Union Road, Farnham, Surrey, GU9 7PT Our main trading address is Unit 2, Durleigh Marsh Farm, Petersfield, GU31 5AX. Our VAT number is 799691147. All intellectual property rights concerning this web site including, but not limited to design, text, graphics, logos, images and other materials are owned by Wilsbury Ltd, our licensors, our partners or our affiliates. No content or trademarks may be reproduced, copied, used, sold, and duplicated without our prior written consent. After placing your order, you will be sent a confirmation e-mail detailing your transaction ID number and confirming the value of your order, which has been debited from your credit or debit card. If you have any queries regarding your order please contact our customer service team on 01730 818300 or send an e-mail to info@realflowers.co.uk. Our customer service team is available from 9.00am to 5.00pm Monday to Friday. The purchase of alcohol from The Real Flower Company is subject to age requirements specified by law. Under the Licensing Act of 1964 (United Kingdom), 1976 (Scotland), 1988 (Ireland) and 1990 (Northern Ireland); it is illegal for any individual under the age of 18 to buy, or attempt to buy, alcoholic liquor. For this reason we may refuse an order or refuse to make a delivery to anyone we suspect to be under 18 years old. By placing an order online you are confirming that you the person ordering the alcohol and that the designated recipient is aged 18 or over. Alcoholic deliveries must be signed for by an adult aged 18 years or older. If there is no one 18 or older at the address when delivery is attempted the goods will be retained by the driver until delivery can be rearranged by the intended recipient. Alternatively on placing an order you may give instructions explaining if and where you would like the items to be taken and signed for by an appropriate adult – such as with a neighbour (aged 18 or over). Please note that this must be an address within the neighbourhood. With the exception of our Trade section, all prices for products on our website are inclusive of VAT at current rates. All prices exclude delivery. Our site contains a large number of products and it is always possible that, despite our best efforts, some of the Products listed on our site may be incorrectly priced. If a product's correct price is higher than the stated price on our site, we will normally, at our discretion, either contact you for instructions before dispatching the Product, or reject the order and notify you of such rejection. We will send out goods according to the delivery day and option selected. We reserve the right to substitute flowers or foliage to the value of the order placed if we do not have the exact flowers or foliage in stock. Our goods are sent out by courier on a signature optional delivery. This means that the flowers can be left on the property (porch or step) or with a neighbour if there is no one home to accept delivery. If there is an alternative place to leave the flowers on the property please specify this when prompted to do so in the checkout area of our site. If you do not want the flowers to be left if no one is home then please write this in the comments box in the checkout area, the flowers will be taken back to the delivery depot and the recipient will be left a card asking them to call to arrange redelivery. We guarantee our bouquets for 5 days from delivery provided that the care instructions are followed. Our petals will last for approximately 24 hours from the delivery date if they are kept in a cool place. 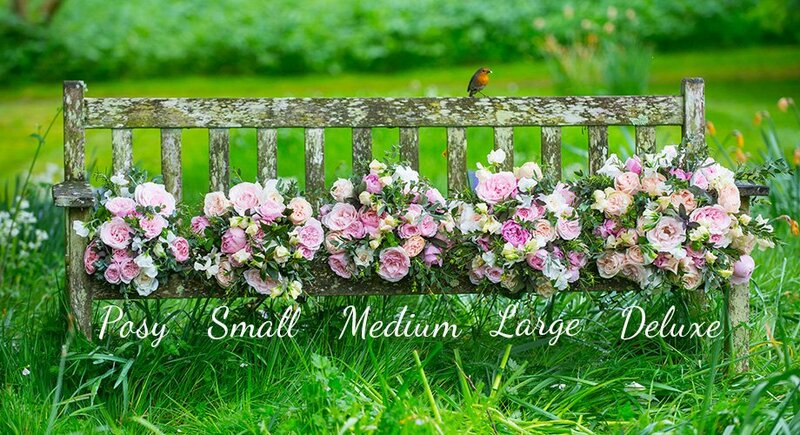 We endeavour to dispatch all of our flowers in perfect condition. In the unlikely event that your flowers have been damaged in transit please keep the flowers and contact us within 24 hours of receipt. We cannot be liable for claims reported outside of this time. Where possible we will offer to replace the damaged flowers, however if this is not possible we will offer a full refund to the purchaser. We require two working days’ notice prior to the delivery date for cancellations of bouquets and fresh petals in order to avoid wasting the flowers our farmers have cut for you. For other non-perishable products, we require one working days’ notice prior to the delivery date. Should you need to cancel an order for any reason please e-mail us using the form in our Contact Us (link )page or telephone us on +44 (0)1730 818300. We have taken great care that your visit to our website is a positive one and that your privacy is always respected.